We just released WPForms 1.2.6 that came with a lot of payment enhancements that you were looking for. Here’s what you need to know about WPForms 1.2.6. This was by far one of the most popular feature request. While it seems simple in concept, there’s a lot more that has to be done behind the scenes to make it work. Well, it’s available now with both payment providers (PayPal and Stripe). Currencies we support include: U.S Dollar, Great Britain Pound, Euro, Australian Dollar, Brazilian Real, Canadian Dollar, Czech Koruna, Danish Krone, Hong Kong Dollar, Hungarian Forint, Israeli New Sheqel, Malaysian Ringgit, Mexican Peso, Norwegian Krone, New Zealand Dollar, Philippine Peso, Polish Zloty, Russian Ruble, Singapore Dollar, South African Rand, Swedish Krona, Swiss Franc, Taiwan New Dollar, and Thai Baht. 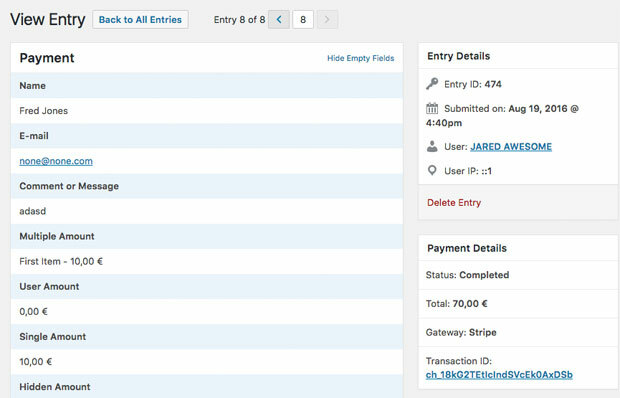 Now you can see payment details on individual entry details page. You can also see the status and amount on the forms page, and you can sort the items by status and price as well. I know I promised the Zapier integration will be part of this release. We did our best, but we couldn’t get it live this week. We’re in the working beta phase with the Zapier team and hoping to get it live as soon as possible (ETA next week). Update: The Zapier addon is now available! Thanks once again for all your support and feedback in making WPForms the best WordPress form plugin. I recently bought wpforms pro. Unfortunately, my country currency ( AED/Dirhams ) is not available in the list payment of Paypal and Strip. Although, and also in wpforms. I’m preparing a quote form to estimate total price in ( AED/Dirhams ) based on client selections. Any advise that I can change symbol ( $ ) in wpfrms to my country currency ( AED/Dirhams ), just for online calculation. I would like to suggest providing currency switcher feature, the price based on currency rate and payment will be in currency available payment of Paypal and Strip. Sure, we’d be happy to help. When you get a chance, could you please get in touch with our support team? We’ll be able to share the steps from there. Is it possible to have different forms support different currencies? In the screen shot on this page there seem to be individual entries in both GBP and USD. However the settings only allow for one option to be selected. Currently we don’t have the option to set different currencies in across different forms on your site. I apologize for the inconvenience and confusion! Are there any plans to implement multiple currencies for a single form in the future? I definitely agree that allowing the option for multiple currencies in a single form would be extremely helpful but at the moment I don’t have an ETA on if and when this feature will be available on WPForms. Our development team is always working on adding in new features that will make the plugin easier and more helpful for our users. I have your wpforms subscription but i can only add one currency? i want to add euro to. 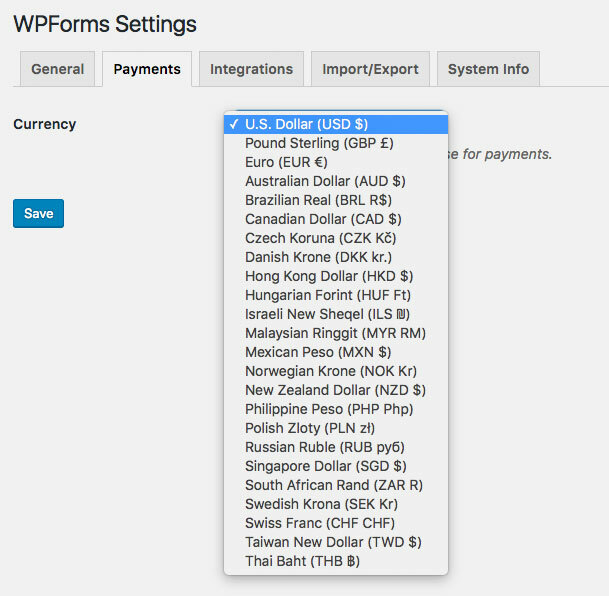 To change the currency used in your forms, go to WPForms > Settings and open the Payments tab. The very top item is a dropdown for Currency. Please note, however, than you can only apply one currency at a time for all of your forms so you can’t use, for example, both Euros and USD at the same time.